Acid Reflux Causes, Symptoms and Treatment are no mystery to our group of highly trained professionals focused on ensuring your health for a lifetime. Acid reflux is just another term for gastroesophageal reflux. The stomach juice that refluxes contains many chemicals, of which acid is only one. Drugs that are used to treat GERD decrease or remove acid from the juices that are refluxing, but the reflux continues. Acid reflux describes the situation when stomach juice moves upward into the esophagus (swallowing tube) due to a malfunction of the special “valve” (LES) that separates the two structures. Stomach juice is composed of a wide array of chemicals including, among others, bile, enzymes and acid. The term acid reflux is used because of all the chemicals in the stomach juices that reflux, it is the acid that causes irritation of the esophagus. Acid Reflux symptoms are divided into two categories; typical and atypical. The typical symptoms are heartburn, regurgitation and trouble swallowing. Atypical symptoms include, cough, hoarseness, sore throat, dental disease, worsening asthma and even bad breath. The typical symptoms tend to respond well to treatment for acid reflux, while the atypical symptoms are much more difficult to deal with. Acid Reflux Treatment focuses on the acid itself, and not typically the reflux. When reflux occurs due to the damaged valve, removing the acid from the refluxing stomach juices improves the symptoms. This is done using acid reducing medications. These medicines include Proton pump inhibitors (PP)s) including Prilosec, Nexium, Prevacid, Dexilant and others. Less potent H2 blockers include Zantac and Tagamet. Topical antacids such as Mylanta and Tums also help. These medications are usually required for life. There are some long-term side effects of these medications that can be problematic. These are thought to include an increased chance of hip fractures, low magnesium levels, increase in certain types of pneumonia’s and greater risk of development of a serious colon infection. Also of note is that lifestyle changes can help treat acid reflux as well. These include elevating the head of the bed, not eating before bedtime, losing weight and avoiding certain foods that rend to trigger reflux. These foods vary from person to person. For some patients, focusing on the reflux rather than the acid is a good option. 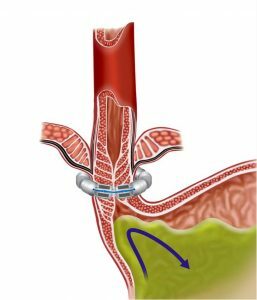 There are several minimally invasive surgical procedures that restore function of the damaged LES which reduces or eliminates the reflux. The acid stays in the stomach where it belongs! Today, make that decision to contact Dr. Nilesh Patel. Register for your FREE Seminar at one of our acid reflux treatment centers. If you would like to speak to someone about acid reflux causes, symptoms and treatments please fill out our online contact us form.